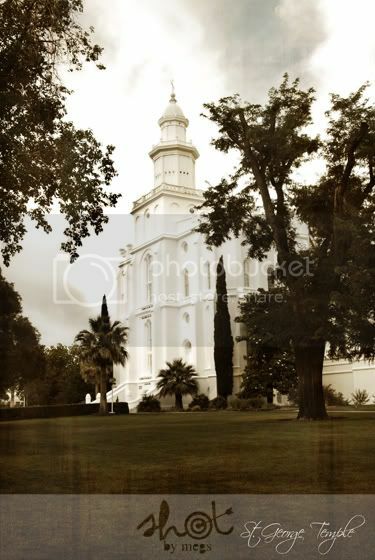 Shot by Megs: *St. George Temple Print Giveaway! *St. George Temple Print Giveaway! One lucky winner will win an 8x10 print of my St. George Temple Shot! Or if the winner prefers, an 8x10 or 8x12 of any other artistic or landscape image I've shot. This print is also available for purchase---contact me for details. The print will be in sepia tone and will be cropped to format an 8x10. The "St. George Temple" writing will still appear near the bottom of the image. add a link to my website while you spread the word! You can grab my button (also located at the bottom of my blogsite) or just reference www.stgeorgephotography.com. and leave a comment on this post with your name and tell me what you did! The deadline is Wednesday August 11, 2010 at 11:59PM. The winner will then be randomly selected from the post comments and then announced on next Thursday's post! Entrants must live in the United States. Kelly and Stephanee's information can be found here. Or you can click on their button at the bottom of the page. Hey I put their info on my facebook!! I spread the word on facebook!